Since the guest rooms of accommodation are located in the second floor of the host family&apos;s house, we are happy to help you and provide you with information and tips regarding places worth visiting and local events. The house will quiet down and go to sleep from 11 P.M. to 7 A.M. during which time you are kindly asked to take others into consideration and avoid making unnecessary noise. Your room is available from 4 P.M. on the day of your arrival and has the check out has to be done by 12 noon on the day of your departure. Smoking is strictly prohibited inside all the buildings. Pets can&apos;t come inside the house due to allergies. Because of the stairways the accommodation is not suitable for people with moving disabilities. The link provides useful information about payment, cancellation of booking etc. 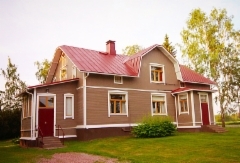 Click here to print out the booking conditions of Härmälä (PDF). Going to a concert, event, contest, theatre, fishing trip or merely cruising along the Kokemäki river? 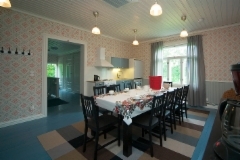 Book a room from Härmälä!